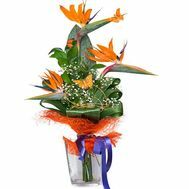 A bouquet of strelitzia is a hot gift from sunny countries, which will cause not only a smile, but also violent emotions. 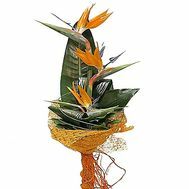 Unusual, memorable, this "bird of paradise" attracts the eye and forces to fall in love with it again and again. 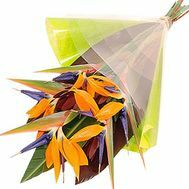 An unusual kind of strelitzia allows you to use it in various situations, both in business and in romantic. 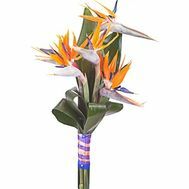 You can buy a bouquet from strelitzia in the same way as a beloved woman in honor of her birthday or anniversary of relations. The brightness and originality of the flower will cause incomparable emotions and decorate any day. 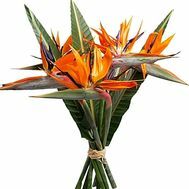 Strelitzia is a wonderful basic, as well as an additional gift to anyone else. Her charisma and natural charm will give a sea of impressions to everyone who dares to acquire this beautiful "bird"! Our reputation is growing rapidly every year, despite the fact that the Ukrainian market we have more than 10 years. In our store you can find everything that will make the customer happy: low prices, pleasant discounts and various promotions. In addition, we give the opportunity to review the reviews of customers of our store, posted on the site. As well as making out free delivery in major cities of Ukraine, which greatly simplifies the purchase. Buying flowers with delivery along with us is profitable and easy, and you can try out our service today!